Lots of tiaras start off as wedding presents to royals from family members, wealthy patrons, and organizations. Often those presents are cherished treasures, in part because of their associations with their gifters. But that's not always the case. Today, we're looking at a tiara that actually started off in a very different form -- and as one of the wedding gifts presented to Queen Ena of Spain. Queen Ena was born Princess Victoria Eugenie of Battenberg, one of the granddaughters of Prince Albert and Queen Victoria. 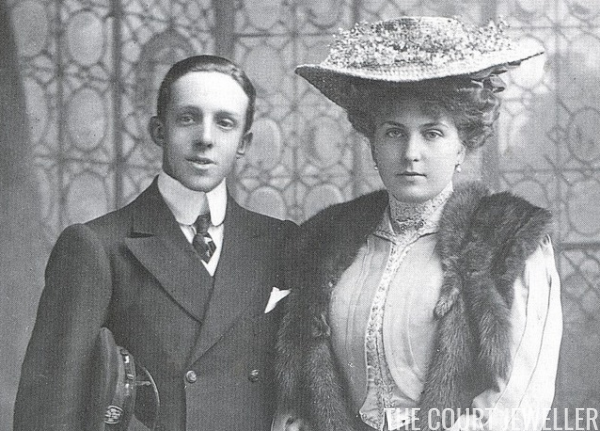 When Ena married King Alfonso XIII of Spain in 1906, she received a pearl tiara, made by Ansorena, from her new mother-in-law, Queen Maria Cristina of Spain. Eventually Maria Cristina relented, and Alfonso and Ena were allowed to wed. Perhaps this tiara, which was part of a larger pearl and diamond parure, was meant to be a peace offering. But if it was, its effects are dubious. Ena was never photographed wearing it; indeed, the only photo (linked above) of the tiara I’ve been able to track down is from the record of Ena’s wedding gifts. Clearly it was not one of Ena's beloved pieces of jewelry. The lack of photographs is for good reason: the tiara didn't last long in its original form. Instead, Ena decided to reimagine the piece. 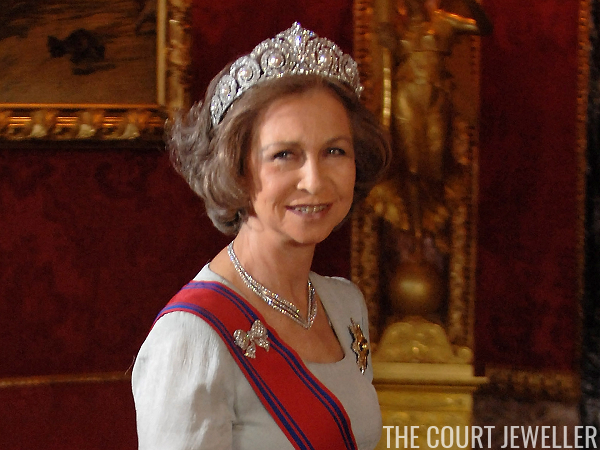 While the original tiara was made by Ansorena, Cartier was tasked by Queen Ena in the 1920s with taking apart the old sparkler and refashioning parts of it into this new piece. The Cartier version of the tiara is made of diamonds set in platinum, with eight large pearls set in the center of each of the large scrolling diamond elements on either side of the piece. The scrolls themselves are designed to look like coiling sprigs of laurel. Originally, the pearls in the tiara could also be replaced with emeralds; Ena frequently wore the tiara with emeralds and paired it with other pieces of emerald jewelry, some of them inherited from Empress Eugenie of France. (Sadly, Ena's emeralds were reportedly sold sometime after the family's exile.) 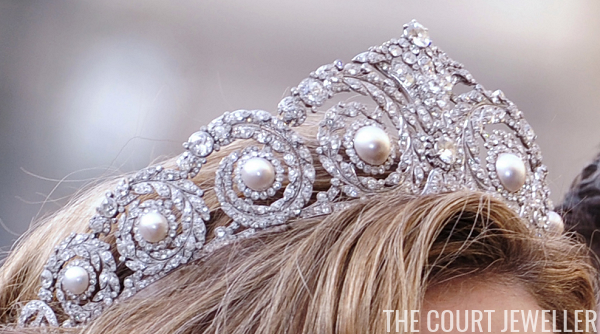 Ena also sometimes added an additional pearl button to the very top of the tiara. When Ena died, she left the tiara to one of her daughters, Infanta Maria Cristina of Spain, who had married an Italian count. But never fear -- in 1996, after Maria Cristina’s death, the tiara was reunited with the main line of the Spanish royal family. Whether King Juan Carlos inherited the tiara or purchased it for the queen has apparently never been made public. 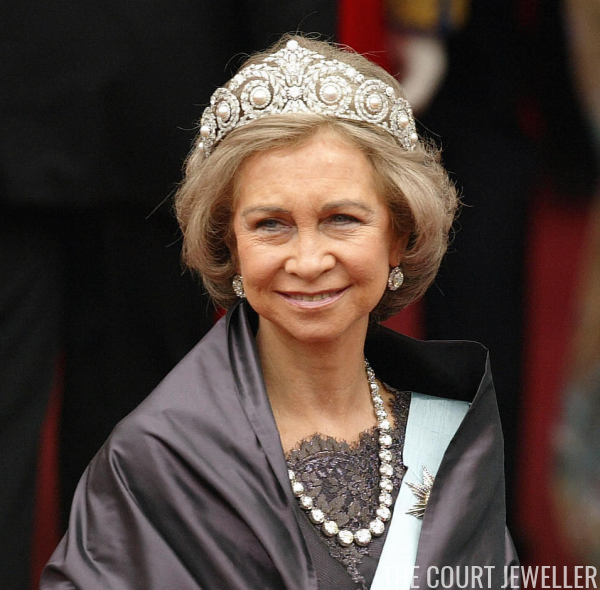 Regardless, by the late 1990s, a Spanish queen was seen wearing the Cartier tiara once again. To my knowledge, Queen Sofia has only lent the piece to one other member of the family: her younger daughter, Infanta Cristina, who wore the tiara at the Swedish royal wedding in 2010. Although she continues to possess a large number of tiaras, it looks as if Sofia may have decided to stop wearing them altogether. She attended the wedding of Prince Leka of Albania this weekend and decided not to wear a tiara at the evening reception, even though many other royal women did. So what does that mean for Sofia's tiaras? Will they be passed on to Letizia? Will she keep them and loan them out to other members of the family? The Spanish royals are notoriously tight-lipped about their jewelry collections, so we may not know the fate of a tiara like Ena's Cartier diadem until we see another royal woman wearing it in public.